Volunteering your time or money is an excellent way to look beyond yourself and help others in need. Meet some folks in our region who’ve found meaningful ways of serving their neighbors, and learn how you can join them in brightening someone else’s Christmas Cheer. Members of St. Michael’s Episcopal Church join with volunteers from the community to prepare and serve the church’s annual Thanksgiving dinner. The meal draws people from around the Barrington area who seek a little company during the holiday. Volunteering your time is a perfect way to bring hope, love and joy to those less fortunate this holiday season. Whether it’s donating time and money, handing out hot meals on Thanksgiving or ringing a bell outside a department store, people right here in our region have a long tradition of generosity, especially during the holiday season. Volunteerism is also a wonderful way to meet friends who share similar interests and it’s a great way to learn something new. With budget cuts and dwindling resources affecting many area nonprofits, organizations today rely on volunteers more heavily than ever before. Here are three ways the Christmas spirit is alive and well in northwest Chicagoland. This congregation and its many friends know how to celebrate Thanksgiving in style. For the 12th year now, dozens of volunteers will wake up early on Turkey Day to prepare, cook and serve a traditional Thanksgiving Day dinner for hundreds of people who are alone, homeless or looking for a new place to fellowship. A fixture in Barrington, this church at 647 Dundee Ave. was founded in 1948 and its members have celebrated a long history of generosity. While volunteers help with the setup and food preparation, the church relies on local donors to provide 95 percent of the food, including dozens of turkeys. The idea for this dinner came from Catherine Deevy, a church parishioner and a former restaurant owner in Barrington. 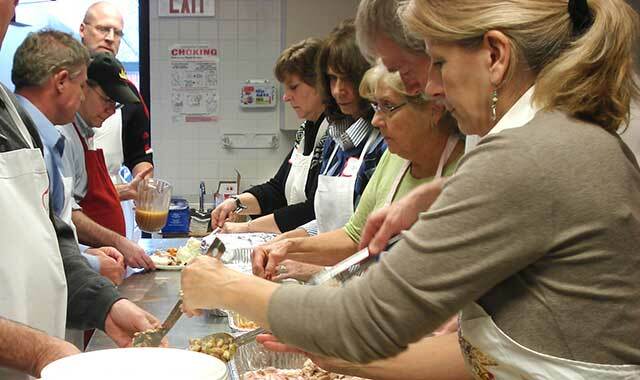 At 8 a.m. on Thanksgiving morning, dedicated volunteers begin peeling, slicing and preparing the home-cooked meal, which includes the traditional lineup of roast turkey, stuffing, potatoes, vegetables, cranberries, rolls and dessert. Lots, and lots of dessert. The dinner is held at the church and served promptly at noon. Other than the turkeys, which are cooked at home by volunteers, the meal is prepared at the church. More than 200 people file into the church’s community room, which has circular tables decorated with donated white linen tablecloths and napkins. The dinner is free of charge and open to everyone – whether or not you’re a member of the church. St. Michael’s parishioners, local families and anyone from the community who wants a free meal attends the annual dinner. The church also welcomes recruits from the Great Lakes Naval Station, in Great Lakes. Since they’ll be unable to spend time with their families, they can still enjoy a warm holiday meal, and they’ll also have access to computers and phones to connect with their loved ones back home. Before dinner is served, the food is blessed by one of the church pastors, and students from nearby Barrington High School sing the national anthem. Musical entertainment during the meal is provided by Premium Blend, an all-girls a capella group from Barrington High School, and the Gabis Family Trio, comprised of three teens who are members of the church. “They volunteer their time and talent,” Holmes says. To continue with Thanksgiving traditions, NFL football games will be running on a 9-foot-by-12-foot screen. The dinner would not be possible without the help of volunteers like Kimberly and Dave Beal of Port Barrington. They wanted to donate their time and energy to those who need it most. The couple, who have participated in the dinner for eight years, aren’t members of St. Michael’s, but they’ve become a familiar part of this holiday family. They see their service as a valuable way of giving back to the community. Dave has been a chef for 50 years, so he fits right in. He’s in charge of carving the turkeys. As long as people continue to show up, the Beals plan to continue helping. Reservations are required. If you plan to attend, call the church at (847) 381-2323. When you think about the Salvation Army, you instantly think about the volunteers who stand outside of stores ringing bells and directing you to that red kettle around the holidays. However, there are plenty of other ways to get involved with this charitable organization, especially during the holiday season. The Salvation Army provides social services to individuals and families who find themselves without basic necessities for survival. Services include a food pantry, utility assistance, domestic violence help, and employment and crisis resources. Judy Seredick has been volunteering with the Salvation Army for 13 years. From preparing backpacks ful­l of school supplies to interviewing clients, Seredick has done a lot of volunteering for the Salvation Army. In fact, she’s volunteered so much that she’s been given her own office. Seredick has also put in time volunteering for the annual Thanksgiving Dinner, scheduled this year for Nov. 22 at the Salvation Army’s Crystal Lake location. Food is catered in and served to needy families by a cadre of staff and volunteers. An easy way to volunteer this holiday season is through the Salvation Army Angel Tree Toy Drive, which provides new toys for the children of needy local families. Beginning in November, Angel trees will be decorated with numbered paper angel tags, each bearing the gender and age range of a child and a specific or general gift need. Contributors remove one or more tags from the tree and purchase gifts for the child or children described on the tags. Companies and organizations in McHenry County display angel trees, and community members place unwrapped gifts by the tree. Whether you’re an individual, family, organization, church, business or club, you can help make a difference by accepting any number of Angel Tree tags from the Salvation Army. Angel Trees can be found all over the county, including Buffalo Wild Wings in Algonquin, City of McHenry Municipal Building and McHenry Savings Bank in McHenry. And, of course, there’s the Christmas Kettle Program, which begins Nov. 10 this year. With more than 50 bell-ringing locations in McHenry County, the Salvation Army is dependent on the generosity of community members, churches, service organizations, schools and businesses to devote their time bell-ringing for a few short hours each day. Volunteers are always needed. Last year, 1,500 bell-ringing volunteers raised $213,000 for the Salvation Army of McHenry County during the six-week campaign. This year’s goal will be similar. “That is actually our most critical need right now,” Pal says. Any money raised in McHenry County stays locally to help needy families throughout the year. The money from the bell ringing campaign is also vital to the social and community services the Salvation Army provides. For more information, call (815) 455-2769. Every day, abused and neglected children in Kane County are placed in temporary foster care because their parents can’t, won’t, or don’t know how to take care of them. Court Appointed Special Advocates (CASA) of Kane County gives these kids a voice in court so they have the opportunity to grow up in safe and permanent homes. CASA Kane County, of 100 S. Third St., Geneva, is one of more than 1,000 national CASA programs that advocates for abused and neglected children within the court system. CASA volunteers are appointed as Guardians ad Litem (GAL) for children under 21 who are in the foster system. These volunteers act as the eyes and ears of the judge by documenting each child’s circumstances and making recommendations for services. The ultimate goal of the CASA/GAL is to help ensure every child receives services that are needed and that the child is placed in a safe and permanent home in the least amount of time. This could mean a reunion with their parents, guardianship, independence (if the child is older) or adoption by a foster family. Before a volunteer can accept a case, he or she must complete 45 hours of training provided by the CASA Kane County office. The training includes classroom attendance, guest speakers, a training manual, online resources, report-writing practice and court observation. Among other things, the training curriculum covers the role of the CASA/GAL, cultural diversity, family issues, child abuse and neglect, mental illness, poverty and substance abuse. If you don’t have the time to get involved as a volunteer, individuals can set up a collection through CASA’s gift/gas card, suitcase and incidental program. It’s another part of the organization’s mission to help provide the children with transportation, recreational activities and other basic items that are needed but often taken for granted. Gift cards are used to purchase items like mattresses or winter coats; bus passes for school, work or visits to a friend or loved one; and summer camps or other park district-type activities. Gas cards help CASA volunteers who are traveling long distances to visit their children. “This initiative is another angle to allow anyone to give gift cards or gas cards so we as an organization can buy children basic items and give them opportunities they should have as kids,” Hipp says. For more information or to volunteer, call (630) 232-4484. Volunteerism is more than just helping those who are less fortunate. It’s an opportunity to meet people and a way to leave your mark on the community. The Christmas spirit is alive and well in Chicagoland. If you’ve been thinking about volunteering, now is a perfect time to take the leap and help someone who is less fortunate. This entry was posted on Friday, November 3rd, 2017 at 11:57 am	and is filed under Features, Top Posts. You can follow any responses to this entry through the RSS 2.0 feed. Both comments and pings are currently closed.